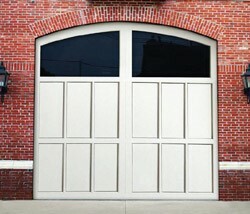 doorLink Mill Creek Aluminum Carriage Style - The Wright Door Co. The perfect combination of commercial aluminum strength with elegant carriage-style looks. Designed for use in all residential and commercial establishments. Choose from a variety of unique styles and colors to match any need. 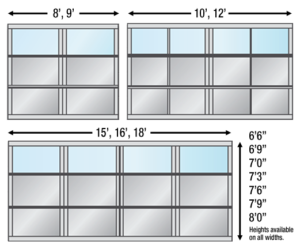 Sections can be glazed with 1/8″ tempered glass or 1/2″ insulated glass. 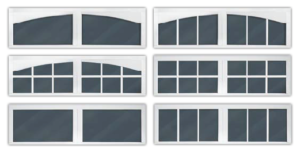 Many options are available including tinted glass or low E glass. 0.062″ powder coated white aluminum panels can be used in any section. The bottom rail has a replaceable U-type bottom astragal. 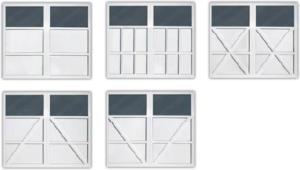 Optional weather-stripping is available for header and jambs. Operation – be manual push up, chain hoist, or electric motor.